MYSTICAL EXPERIENCE OR BRAIN MALFUNCTION? Probably millions of North Americans believe that they have had a God experience. They have sensed the presence of Jesus (or the Buddha, the Goddess, Jehovah, Krishna, etc., depending on their cultural tradition). This happens more frequently during times of fasting, prayer, meditation, anxiety, and/or stress. Christians often report hearing a still, small voice that they regard as coming from the Holy Spirit -- the third person in the Christian Trinity. Religious folks of various faith traditions generally regard these as real manifestations of the presence of their deity, or of a great spiritual teacher, or of a channeled Ascended Master. However, some psychologists and neuroscientists seek other explanations. They suspect that these mystical experiences may be caused by natural processes functioning (or malfunctioning) inside one's brain. One method of building support for this theory would be to find a way to artificially induce a mystical experience in the laboratory. Another would be to show how a natural disorder, like epilepsy, can produce hallucinations that simulate the God experience. Both methods are described below. This difference between the religious and the secular beliefs is probably not resolvable. It is doubtful whether either side can collect sufficient evidence to convince the other. Michael Persinger, is a professor of neuroscience at the Department of Psychology of Laurentian University in Sudbury, Ontario, Canada. He wondered whether religious, spiritual, and mystical experiences had a natural rather than a supernatural source. He speculates that we are somehow programmed so that they can generate religious experiences via our brain's internal processes. He had noted that there were many points of similarity between seizures experienced by some individuals who suffered from epilepsy, and the types of mental and spiritual experiences that St. Paul, Moses, and many religious mystics had reported. 3 Persinger wondered if visions, a sense of the immediate presence of God, and other mystical experiences could be artificially created in the laboratory by magnetically inducing changes in the temporal lobes of a person's brain. He notes that "The deep structures of the temporal lobe are electrically unstable and sensitive to all sorts of things, including the biochemistry of stress, psychological distress, insufficient oxygen, and fasting. That could explain why, when mystics go through self-induced stressful rituals and yogis go to high mountaintops and fast, they report transcendental events." 5 The use of fasting to induce mystical experiences is found in many spiritual disciplines throughout the world, in Native American religion, Shamanism, Christianity, etc. Persinger developed the hypothesis that people who have experienced above average numbers of complex partial epileptic-like experiences might experience a "proximal presence" during an experiment in which a weak magnetic field was applied either to their right hemisphere, or to both hemispheres. 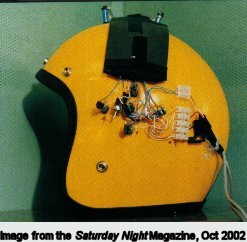 He built a Transcranial Magnetic Stimulator, starting with a yellow motorcycle helmet, and outfitted it with build-in electrical coils that can create electromagnetic fields in the wearer's temporal lobes. These are the part of the brain which are linked to religious belief, "time distortions, dream states and assorted odd physic phenomena." 5 During an experiment, the subject sits in a quiet, dimly lit, room. Soothing music is played in the background. A "gently flickering strobe light" is provided. The subject's brain wave patterns are monitored by an EEG instrument. By 2002, he had performed the experiment on over 1,000 volunteers. 80% had some sort of supernatural experience. 2 Many say that their experiences were "so profound they would be life-changing had they not understood the mechanistic underpinnings of what they had experienced." 4 About one in every 15 subjects reports an intensely meaningful experience. One saw a figure of Christ in the strobe light. Others, depending upon their cultural background, reported Elijah, the Virgin Mary, Mohammed, or the Sky Spirit. Some have reported out-of-body experiences, a sensation of floating, and a sensation of "great meaningfulness." Robert Hercz, "The God helmet," Saturday Night magazine, Volume 117, Issue5, 2002-OCT.